Several months ago, I was walking down Marquette Avenue with my iPhone and was startled by the imminent possibility that I was about to be hit by a bus…on the sidewalk. Turns out it was just a clever piece of architecture. 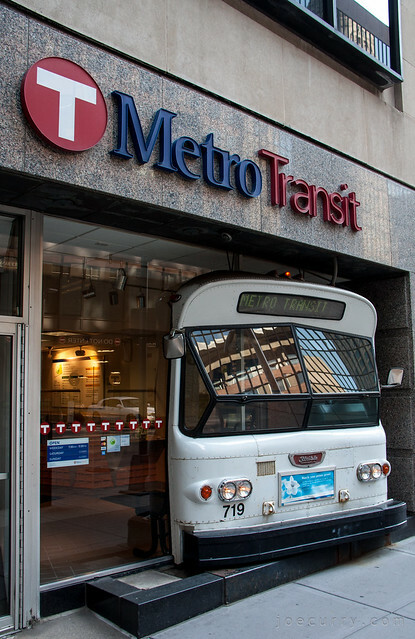 I haven’t had an opportunity to ride the bus lately, but remember my college years of taking the 16A along campus, downtown Minneapolis and St. Paul’s Midway, as well as the 6 to Uptown. I was quite proud of my first Metro Transit ride on my own, from Minneapolis to suburban Wayzata (13 miles). Most often, I’d head to the Target on University Avenue and the Rainbow or Cub Foods grocery store. Fortunately, I had a 21 meal/week plan in the residence hall, since I could only buy as much as I could carry. Other Metro Transit adventures my freshman year of college involved spontaneous trips to Uptown, where we’d enjoy frugal fun nights walking along Lake Calhoun, flipping through racks of used CDs at Cheapo, browsing the shelves of the nearby used bookstore, and eating a midnight snack at McDonald’s.